Yesterday was such a thrilling day! The Holy Spirit has answered our prayers! All of us who prayed for our cardinals to heed the Holy Spirit's whispering guidance will now be offering a prayer in thanksgiving. We have a very humble holy father who apparently is very strong when it comes to defending the Church and her teachings. He is also very concerned about all her people. He sees Christ in each one of us as the photo below shows. He took the name of a man so humble he did not think himself worthy of even being a priest. St. Francis of Assisi. He is the first Jesuit to become a pope. 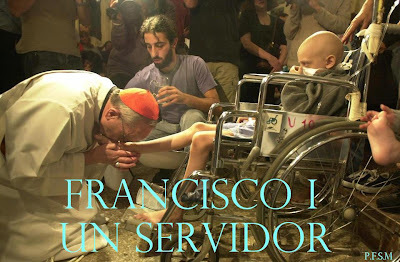 This surprised the world since (with all due respect to all the Jesuit priests) humility is not the first word one thinks of when we hear the word Jesuit. To paraphrase Cardinal Timothy Dolan of New York, that is all gravy on the meat. He was chosen because of his strength and his inner peace. He is what the Church needs at this time. 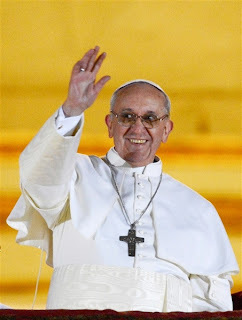 Personally, it is very exciting having a pope from South America! What pride for all Latin America! It is also encouraging since South America has been losing many of Catholics to evangelical Protestantism or to the secular world. 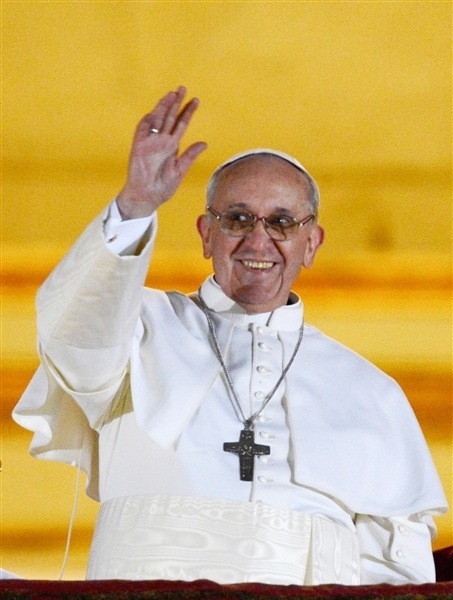 The election of Pope Francis is just what Latin American needs to bring many Catholics back home to Rome. Oh, how unspeakable is the pleasure given to Jesus Christ by a pastor, who often in public, as well as in private, fulfills this duty! How, then, does it happen that so many pastors neglect to comply with this most essential duty? It is principally because they themselves have never learned how necessary prayer is, and how efficacious, if performed well." Anyone who receives Holy Orders without having the sign of a true vocation from God becomes guilty of mortal sin... This terrible fate (the punishment of Core, Dathan and Abiron, who wished to exercise the functions of High Priest without being called...) St. Ephrem considers as reprobates all those who dare become priests without a Divine vocation. 'I am astounded at the madness of those who are so presumptuous as to perform the functions of the priesthood without having grace for it from Jesus Christ. Unhappy wretches! They do not consider that by doing so they are preparing from themselves everlasting torments.' I would therefore earnestly urge all those young men who are studying for the priesthood, without having an evident vocation, to give up the idea as soon as possible. The sooner they do t his the better it is for themselves, and for thousands of others. "My dear young friends, consider well the high dignity to which you are called. The priesthood is the highest dignity on earth. Innocent III says, 'The priest is placed between God and man; he is less than God, but more than man. '...whosoever intends to embrace the ecclesiastical sate must not only be free from mortal sin, but he must also be enriched with every virtue. The Church during eleven centuries, excluded from this holy state everyone who had committed even one mortal sin after Baptism; and if anyone, after having received Holy Orders, fell into a mortal sin, he was deposed forever from his sacred office, for the simple reason that he who is not holy should not touch what is holy. This severe discipline of the Church... has been greatly mitigated; but it has been always required that he who had in his past life become guilty of grievous sins, and desired to receive Holy Orders, should first lead a pure life for some time previous to his ordination. It would certainly be a mortal sin to receive any of the Holy Orders while still addicted to a sinful habit. ...A certain author says, 'those who know that their hearts are enslaved by sinful habits, and still dare to receive Holy Orders, should rather be led to a place of execution than to the Church of God.' ..."
There is a lot more written but I will stop here as there is much food for thought. As always, please remember to pray for our seminarians and our priests. 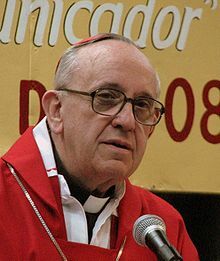 Jorge Mario Bergoglio, Cardinal of Buenos Aires, Argentina. The first pope from South America! 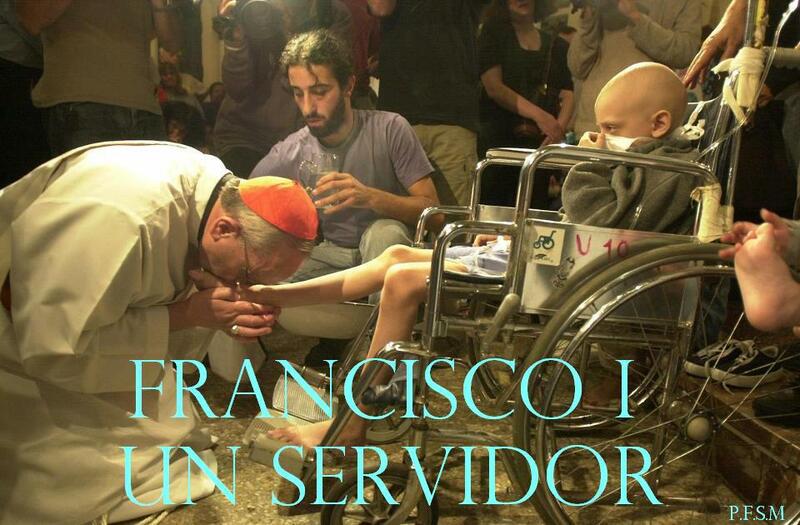 learn a little more about our new holy father. 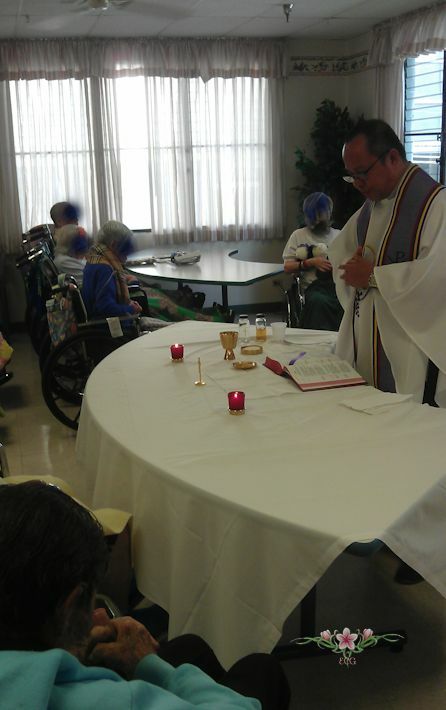 It seems he is a very humble and holy priest. 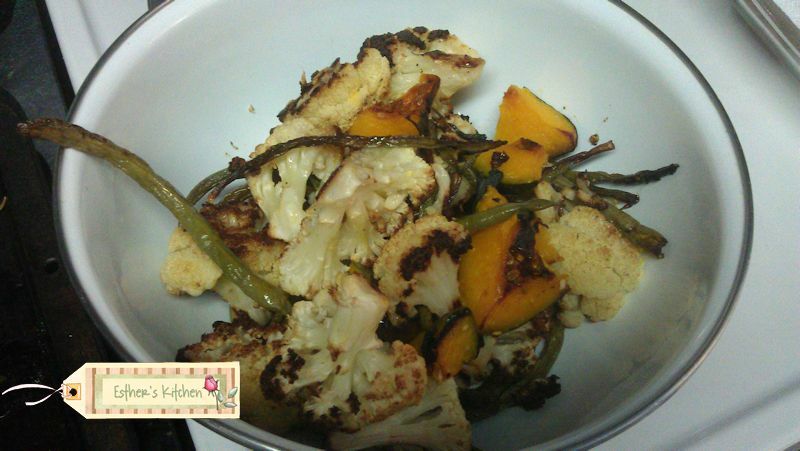 Place the cauliflower segments, green beans and pumpkin in a large bowl along with the garlic, olive oil, red pepper flakes, lemon juice. Blend well to make sure the olive oil coats the vegetables uniformly. Salt and pepper to taste. 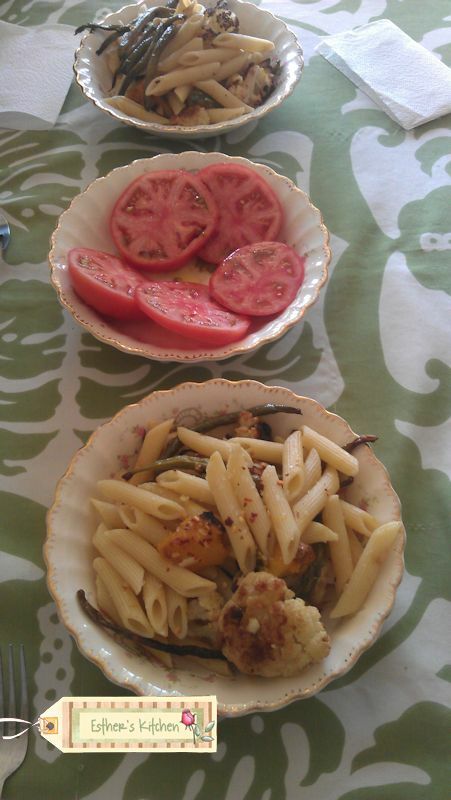 Note: careful with the amount of salt as the Parmesan cheese will be adding salt to this dish. 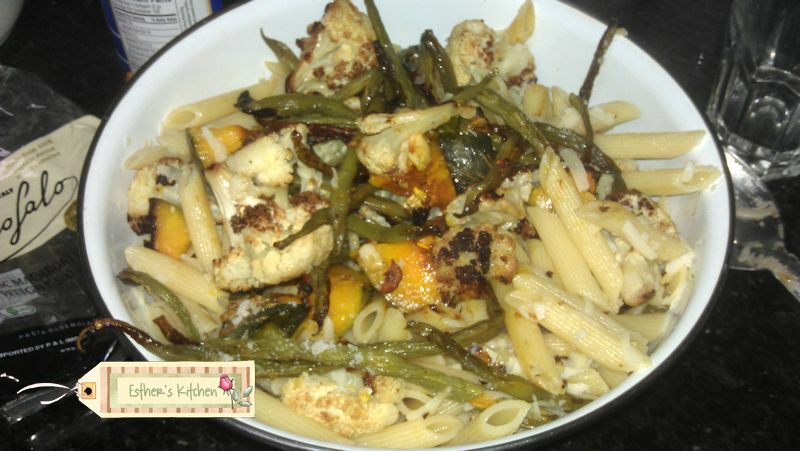 Place all the vegetables onto a large baking sheet. 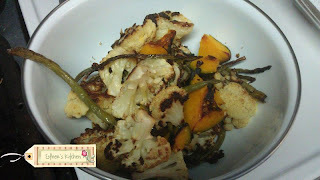 Roast for approximately 30 to 40 minutes or until the cauliflower is cooked through. Careful not to burn. You want to see some brown on the vegetables, but not very brown. When both the pasta and the vegetables are done, place in a large pasta bowl and mix well. Add the parmesan cheese and serve immediately. More red pepper flakes can also be added.